When full of cars at both ends of always position, pillar is the largest vertical stress. When the car at the end of a stretched out arm pillar is the largest vertical stress. It is necessary to make the sports car and the goods shipped free through the support. 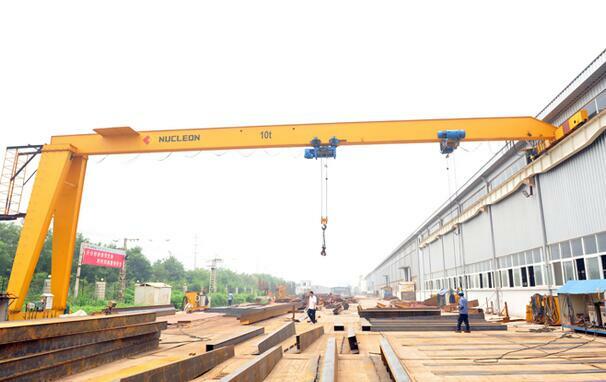 One or two outstretched arm Single Leg Gantry Crane, because of its weight and dynamic load and bending moment diagram and scissors. The brake force of a sports car can be calculated, and the friction coefficient between the wheel and the track is 0.15. Bridge longitudinal wind pressure (full) : take 20 to 25 kg/m2.Due to the action of horizontal force of wind pressure and braking force (in the orbit direction). The stress angle of the girder can be decided, with reference to the content before we say. If we put rails in the lower edge of the longitudinal beam, When placed on an appropriate suspension mechanism, the structure of the pillar and its connection to the main beam are the most simple. The suspension mechanism is also used as a coupling between the reinforcing frames, and all horizontal forces (mass force and wind force) are transmitted to the horizontal coupling on the longitudinal beam plane.